Happy Tuesday everyone, although this post has gone out on Monday night thanks to an over zealous right finger! This week at Everybody Art Challenge we have a simple recipe for you to follow which is "three papers, 3 flowers"
I have made an easel cake card after seeing the fantastic designs created by Kathrin of Kruemels Bastel-Blog and her excellent instructions that can be found at Stempeleinmaleins. 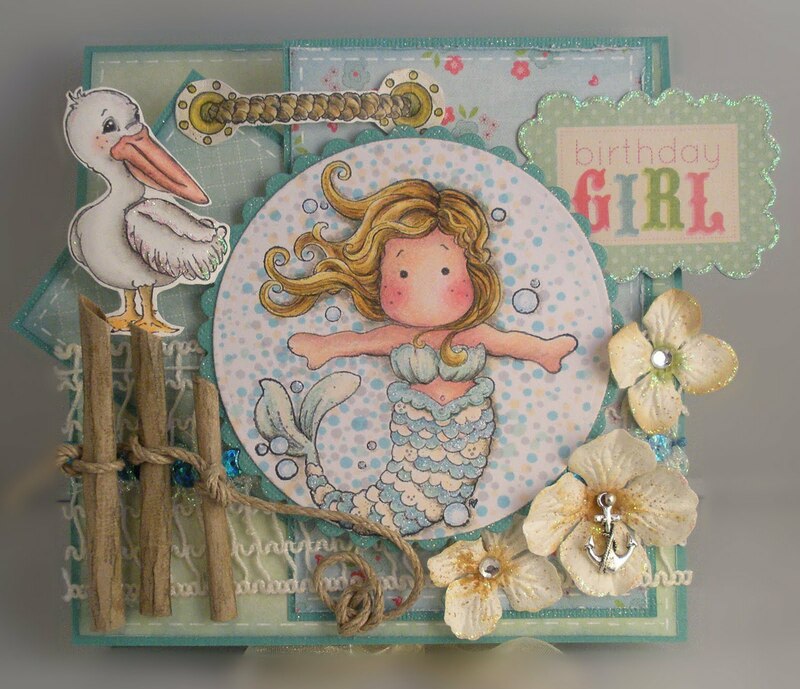 Images - Magnolia Mermaid, Bird and Rpoe from the Summer Stamp Club Kit Medium - Prisma Pencils and Copics Embellishments - various Ribbon, Anchor Brad, 3 Prima Flowers, Candles and String. What is supposed to look like wooden stumps is rolled up pieces of brown paper, distressed with Prisma Pencils. Sentiment - Free with some My Minds Eye Papers in a 2010 craft magazine. I hope you like the card and thanks for looking. Oh this is amazing !! I absolutely love this card. Beautiful!!!!!!! WOW,so adorable and gorgeous too. Jenny this is utterly amazing! 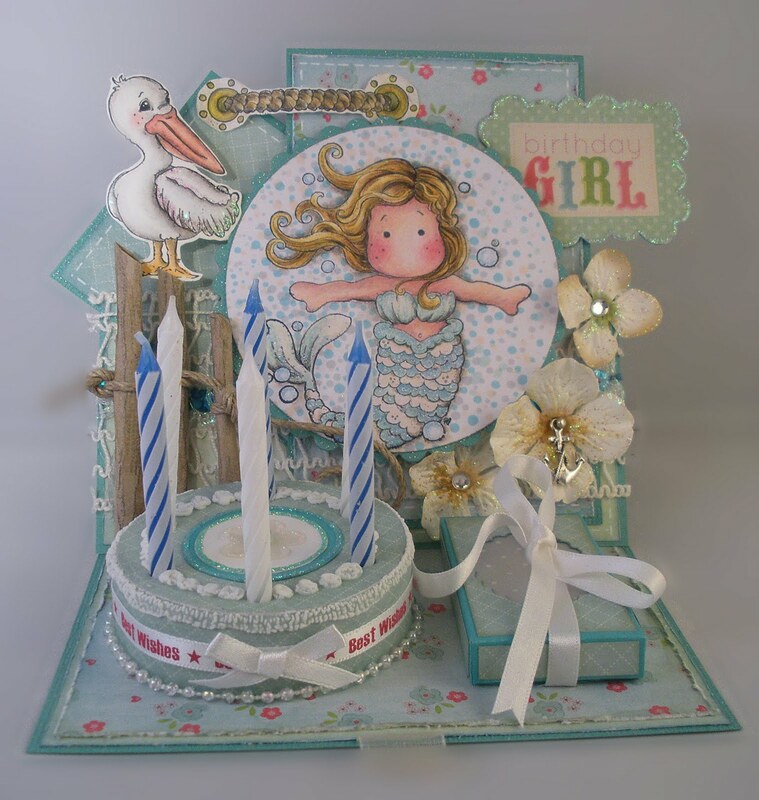 Love your fantastic design and your details are perfect! ich habe gerade Deinen Blog entdeckt und bin total begeistert von Deinen hervorragenden und vielseitigen Werken!! So pretty! Love the colours. Thanks for joining the Pretty challenge at One Stitch at a Time. Gorgeous,thanks so much for joining our Birthday Bash at OSAAT. Holy Smokes! This is GORGEOUS!!!! Fabulous attention to detail! REALLY REALLY great card!! WOW! Thanks for sharing your incredible talent at Catch the Bug! We hope you’ll join us again next week! jenni !!! Wow your card is simply amazing. Its a piece of art. I love it. Wow, this is gorgeous! I love all the intricate details and the color choices you used! Simply stunning! Thank you for playing along with us at the Catch the Bug Challenge Blog, we hope to see you again soon! WOW this is NOT a card this is the whole Birthday present !!! LOVE it. Who wouldn't be happy getting this wonderful creation. BEAUTIFUL & then some !!! Absolutely BRILLIANT work! When I viewed the top pic I was impressed, but then I scrolled down and saw the whole thing, and I'm stunned by how gorgeous it is. Love it!